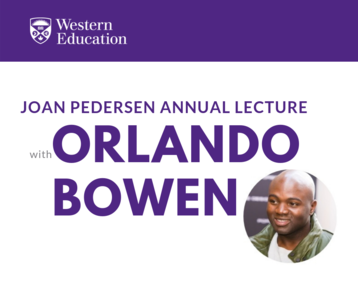 Western University’s Faculty of Education is please to invite you to the Joan Pedersen Annual Lecture with Orlando Bowen! Join us for a fascinating and inspiring discussion on the importance of empowering children and youth through education. All are welcome! During this event we will confer the "Awards for Excellence" recognizing community members' work with Western Teacher Candidates. Do you know an Associate Teacher or Field Experience Host who should be recognized? Nominate them for the Associate Teacher - Award for Excellence or Alternative Field Experience - Award for Excellence. Nominations will be accepted until April 20, 2019. When it comes to building teams, creating momentum, and employing winning strategies, Orlando Bowen is the real deal. For the past nine years, Orlando has used story-telling, fitness activities, and cognitive exercises to teach resilience, leadership, and teamwork to over 300,000 people. Empowering others to overcome adversity, to find their passion, and to use their gifts to serve is the reason Orlando breathes. This mission has placed him on hundreds of stages and boardrooms throughout North America, while also garnering him many distinguished awards. Ten years ago, Orlando thought he was about to die. Pinned to the ground and enduring a savage beating, the then-CFL linebacker had been jumped by two plainclothes police officers, an injustice which was the first of many laid against him at the hands of the police force. “In that moment, knowing my life was about to end, I’m thinking, ‘I didn’t give everything I had to make a difference. There’s more I could’ve done,’ ” he says. Later completely exonerated of any wrong doing, Orlando—incredibly—has publicly forgiven his perpetrators and has dedicated his life to inspiring others to pursue excellence in all they do. Born in Jamaica, Orlando came to Canada as a child and grew up excelling in sports. He earned a full scholarship to Northern Illinois University where he secured a business marketing degree and a Master of Science degree in Information Technology Management. He spent five seasons in the Canadian Football League with the Argos and Hamilton Tiger-Cats, before the concussion he suffered at the hands of the police forced him to quit the sport. Orlando is now the founder and executive Director of One Voice One Team Youth Leadership, which empowers youth to utilize leadership skills and talents to better themselves and their community. He has been repeatedly recognized for his incredible work. 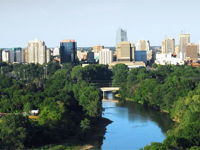 He was selected as one of the 2012 Diverse-City Fellows; is a recipient of a 2012 African Canadian Achievement Award; was bestowed with the Queen’s Diamond Jubilee Medal in 2013; and was the national 2014 Harry Jerome Award winner for community service.